Perfect Shade to cover your Deck, Patio, Pergola, Gazebo, Dog Run, and more. Usually takes one business day! Are you exausted looking for the right sized Shade Cloth Panel that will fit your needs? Want it hemmed, or have grommets, rod pockets or something else? 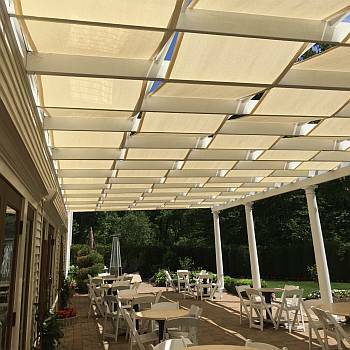 Now you no longer need to cut and piece together shade cloth to achieve the ideal size. 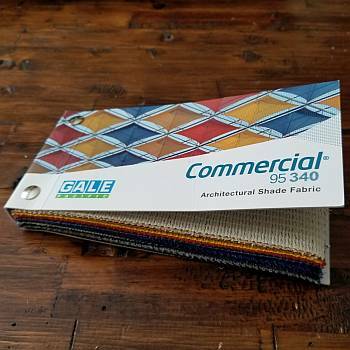 Measure for the size you need, fill out our quote form and we will make a panel with shade cloth to fit your specifications using Commercial 95 fabric by Gale Pacific Commerical who supplies the thinner Coolaroo shade cloth. Commercial 95 fabric is a high density polyethylene knitted fabric that is backed by a 10 year warranty against UV breakdown. This state-of-the-art material blocks up to 98% of the harmful UV rays of the Sun while allowing air to circulate and keeping the environment underneath much cooler. This fabric is unaffected by moisture and natural temperature extremes. And, because Commercial 95 fabric is knitted, not woven, it will not tear or fray. The Commercial 95 material itself is waterproof, but it is a woven mesh fabric and water will go thru the fabric. Custom shade panels prices using Commercial 95 fabric start at $2.95 per square foot with a minimum of 50 sq/ft charge. Fabric samples can be seen at many local hardware stores like Lowes and Home Depot for free or a swatch book can be ordered below. Due to the available Commercial 95 fabric widths, your finished shade cloth may have seams which is normal unless otherwise specified. This helps to minimize fabric waste and helps to keep fabrication costs to a minimum. Features & Specifications for Custom Shade Panel. Perimeter edges can be raw/cut or finished with hemmed only edges. Grommets/Snaps can be put in corners, along some of all the edges spaced evenly about every so many inches apart you choose. Hemmed edges with Grommets/Snaps will have hidden reinforced webbing for added strength. Grommet can withstand up to 80 lbs each. Wind can exert up to 29lbs/sf on any tarp, so take care to add enough attachment points in your panel designs. D-Rings can be sewn into corners like a shade sail. We can sew a rod pocket along an edge so you can slip a rod thru it. Hang it like a curtain, or use the rod for weight or attaching purposes. Velcro closures, Bungee Balls, Rope, Bungee chords, screws/washers, zip ties and much more can all be used to attach your panel. The biggest consideration of any outdoor tarp/panel is the wind. They should be attached taut and with minimal movement to prevent bending of the fabric by wind pressure resulting in fabrics waves which can cause wind whipping or slapping against any other surface(s) to maximize its useful lifespan. Well thought out designs typically result in 5-10 years of usefulness. 2 Years Warranty for defects of materials and on workmanship. Damage(s) caused by improper acts, or by acts of God, excessive winds and/or poor designs will not be warranted. All custom shade panels are made to your designs & specifications. Therefore, all sales are final. No refunds or returns will be accepted.